Below is a brief summary of a few of Dr. John Flackett’s interviews. Visit publications, media/talks and John’s profile page to find out more. John chatted with Invest Adelaide about AiLab, Ten Gigabit Adelaide, the AIML and the opportunity for Adelaide to be an AI Leader in Australia. View the chat on the Invest Adelaide website. Thanks so much: Jake Stoubos and Invest Adelaide for the chat. 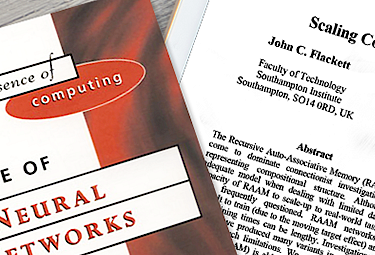 John was interviewed by the Southampton Solent University following his talk on Artificial Intelligence at the Solent organised by the University and the British Computer Society (BCS). View John’s interview on the Solent University website. Thanks so much: Jayne Paddington, Professor Margaret Ross MBE and the University for the interview. John was nominated by Dev Diner readers as an Emerging Tech Inspiration for 2017. View the article on Dev Diner. Thanks so much: Dev Diner and Patrick Catanzariti (Dev Diner Founder) and to all the kind people that nominated John. John was interviewed by The Advertiser newspaper about Artificial Intelligence and the launch of registrations for AiLab at our event ‘Future Jobs in a World of Artificial Intelligence', as part of the Open State Festival in Adelaide, South Australia. Thanks so much: Valerina Changarathil and The Advertiser newspaper for the interview. John Flackett was interviewed by student Caitlin Gardner for Dev Diner about Artificial SuperIntelligence and the future of AI. View John’s interview on the Dev Diner website. Thanks so much: Caitlin Gardner, Patrick Catanzariti (Dev Diner Founder) and Dev Diner for the interview. John Flackett was interviewed by nbn co about Artificial Intelligence, the future and Adelaide, South Australia. View John’s interview on the nbn co website. Thanks so much: Jill Bottrall and the nbn co for the interview.